Increase relevancy: Base on the contacts' interests, behavior & responses we send electronic mailers. 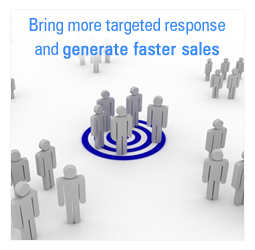 Increase response: Our campaigns drive contacts to personalized, engaging and user friendly landing pages created by us. Score and qualify leads: Based on contacts' attributes and responses from the data-capture forms we qualify them automatically. Close more sales: We dynamically route the qualified leads to your marketing team based on contacts' territory, score, product interest etc. Analysis: We analyze your marketing efforts and guide you further on investing in the campaigns that produce the highest ROI.